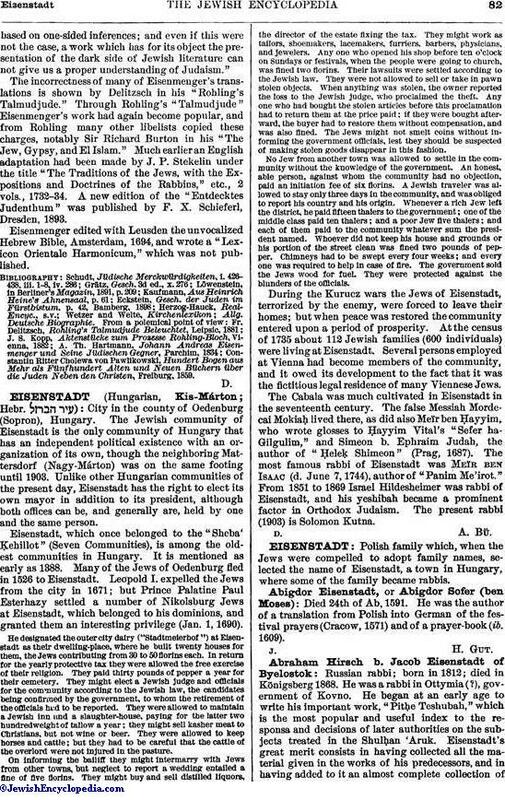 Polish family which, when the Jews were compelled to adopt family names, selected the name of Eisenstadt, a town in Hungary, where some of the family became rabbis. Died 24th of Ab. 1591. He was the author of a translation from Polish into German of the festival prayers (Cracow, 1571) and of a prayer-book (ib. 1609). Russian rabbi; born in 1812; died in Königsberg 1868. He was a rabbi in Ottymia (? ), government of Kovno. He began at an early age to write his important work, "Pithe Teshubah," which is the most popular and useful index to the responsa and decisions of later authorities on the subjects treated in the Shulḥan 'Aruk. Eisenstadt's great merit consists in having collected all the material given in the works of his predecessors, and in having added to it an almost complete collection ofreferences to responsa of all the later eminent rabbis. Of little value are the novellæ which Eisenstadt added to the " Pitḥe Teshubah" under the title "Naḥalat Ẓebi." The part of the "Pitḥe Teshubah" on Yoreh De'ah was published at Wilna in 1836 (republished Jitomir, 1840, and Lemberg, 1858); that on Eben ha-'Ezer, in 1862; and, after the author's death, that on Ḥoshen Mishpaṭ, in Lemberg, 1876 (republished in Wilna, 1896). 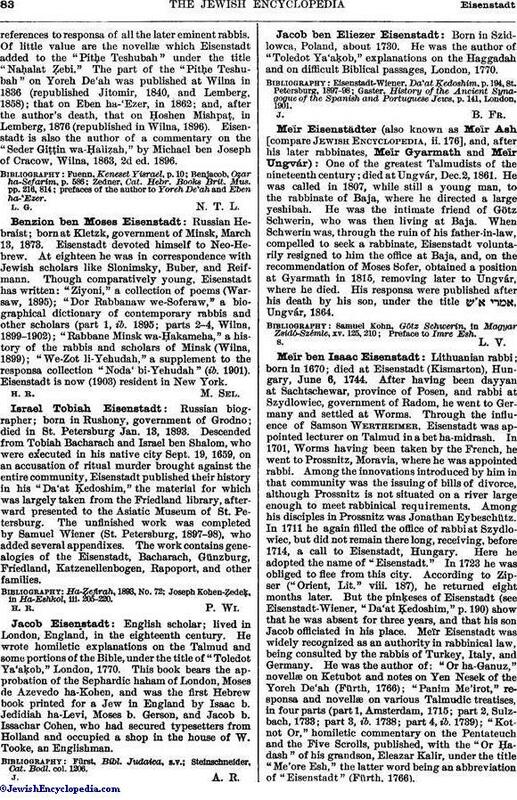 Eisenstadt is also the author of a commentary on the "Seder Giṭṭin wa-Ḥaliẓah," by Michael ben Joseph of Cracow, Wilna, 1863, 2d ed. 1896.
prefaces of the author to Yoreh De'ah and Eben ha-'Ezer. Russian Hebraist; born at Kletzk, government of Minsk, March 13, 1873. Eisenstadt devoted himself to Neo-Hebrew. At eighteen he was in correspondence with Jewish scholars like Slonimsky, Buber, and Reifmann. Though comparatively young, Eisenstadt has written: "Ziyoni," a collection of poems (Warsaw, 1895); "Dor Rabbanaw we-Soferaw," a biographical dictionary of contemporary rabbis and other scholars (part 1, ib. 1895; parts 2-4, Wilna, 1899-1902); "Rabbane Minsk wa-Ḥakameha," a history of the rabbis and scholars of Minsk (Wilna, 1899); "We-Zot li-Yehudah," a supplement to the responsa collection "Noda' bi-Yehudah" (ib. 1901). Eisenstadt is now (1903) resident in New York. Russian biographer; born in Rushony, government of Grodno; died in St. Petersburg Jan. 13, 1893. Descended from Tobiah Bacharach and Israel ben Shalom, who were executed in his native city Sept. 19, 1659, on an accusation of ritual murder brought against the entire community, Eisenstadt published their history in his "Da'at Ḳedoshim," the material for which was largely taken from the Friedland library, afterward presented to the Asiatic Museum of St. Petersburg. The unfinished work was completed by Samuel Wiener (St. Petersburg, 1897-98), who added several appendixes. The work contains genealogies of the Eisenstadt, Bacharach, Günzburg, Friedland, Katzenellenbogen, Rapoport, and other families. Joseph Kohen-Ẓedeḳ, in Ha-Eshkol, iii. 205-220. English scholar; lived in London, England, in the eighteenth century. He wrote homiletic explanations on the Talmud and some portions of the Bible, under the title of "Toledot Ya'aḳob," London, 1770. This book bears the approbation of the Sephardic haham of London, Moses de Azevedo ha-Kohen, and was the first Hebrew book printed for a Jew in England by Isaac b. Jedidiah ha-Levi, Moses b. Gerson, and Jacob b. Issachar Cohen, who had secured typesetters from Holland and occupied a shop in the house of W. Tooke, an Englishman. Steinschneider, Cat. Bodl. col. 1206. Born in Szidlowca, Poland, about 1730. He was the author of "Toledot Ya'aḳob," explanations on the Haggadah and on difficult Biblical passages, London, 1770. Gaster, History of the Ancient Synagogue, of the Spanish and Portuguese Jews, p. 141, London, 1901. 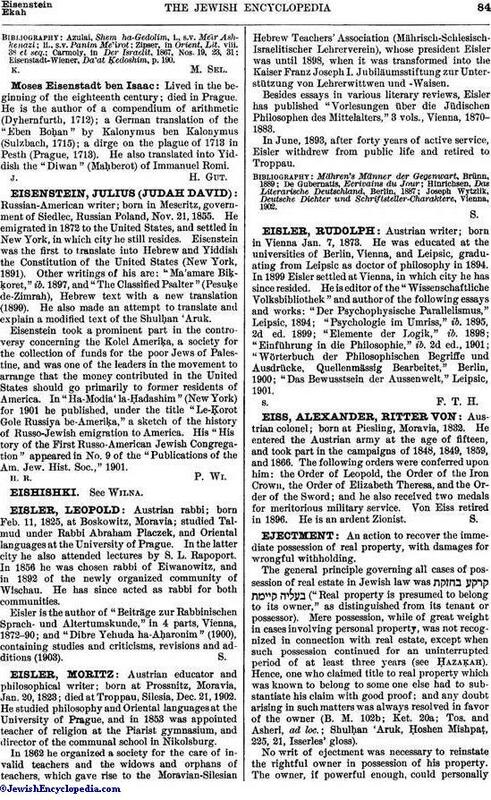 One of the greatest Talmudists of the nineteenth century; died at Ungvár, Dec. 2, 1861. He was called in 1807, while still a young man, to the rabbinate of Baja, where he directed a large yeshibah. He was the intimate friend of Götz, Schwerin, who was then living at Baja. When Schwerin was, through the ruin of his father-in-law, compelled to seek a rabbinate, Eisenstadt voluntarily resigned to him the office at Baja, and, on the recommendation of Moses Sofer, obtained a position at Gyarmath in 1815, removing later to Ungvá, where he died. His responsa were published after his death by his son, under the title , Ungvár, 1864. Lithuanian rabbi; born in 1670; died at Eisenstadt (Kismarton), Hungary, June 6, 1744. After having been dayyan at Sachtschewar, province of Posen, and rabbi at Szydlowiec, government of Radom, he went to Germany and settled at Worms, Through the influence of Samson Wertheimer, Eisenstadt was appointed lecturer on Talmud in a bet ha-midrash. In 1701, Worms having been taken by the French, he went to Prossnitz, Moravia, where he was appointed rabbi. Among the innovations introduced by him in that community was the issuing of bills of divorce, although Prossuitz is not situated on a river large enough to meet rabbinical requirements. Among his disciples in Prossnitz was Jonathan Eybeschütz. In 1711 he again filled the office of rabbi at Szydlowiec, but did not remain there long, receiving, before 1714, a call to Eisenstadt, Hungary. Here he adopted the name of "Eisenstadt." In 1723 he was obliged to flee from this city. According to Zipser ("Orient, Lit." viii. 187), he returned eight months later. But the pinḳeses of Eisenstadt (see Eisenstadt-Wiener, "Da'at Ḳedoshim," p. 190) show that he was absent for three years, and that his son Jacob officiated in his place. Meïr Eisenstadt was widely recognized as an authority in rabbinical law, being consulted by the rabbis of Turkey, Italy, and Germany. He was the author of: "Or ha-Ganuz," novellæ, on Ketubot and notes on Yen Nesek of the Yoreh De'ah (Fürth, 1766); "Panim Me'irot," responsa and novellæ on various Talmudic treatises, in four parts (part 1, Amsterdam, 1715; part 2, Sulzbach, 1733; part 3, ib. 1738; part 4, ib. 1739); "Kotnot Or," homiletic commentary on the Pentateuch and the Five Scrolls, published, with the "Or Ḥadash" of his grandson, Eleazar Kalir, under the title "Me'ore Esh," the latter word being an abbreviation of "Eisenstadt" (Fürth, 1766). Eisenstadt-Wiener, Da'at Ḳedoshim, p. 190. Lived in the beginning of the eighteenth century; died in Prague. He is the author of a compendium of arithmetic (Dyhernfurth, 1712); a German translation of the "Eben Boḥan" by Kalonymus ben Kalonymus (Sulzbach, 1715); a dirge on the plague of 1713 in Pesth (Prague, 1713). He also translated into Yiddish the "Diwan" (Maḥberot) of Immanuel Romi.